The Tea Research Institute at Valparai has seven divisions namely Botany, Soil Chemistry, Entomology, Pesticide Residue, Plant Pathology & Microbiology, Plant Physiology & Biotechnology and Tea Technology. Research activities of Botany Division include plant improvement, cultivation practices and weed research. Plant improvement programme was initiated in 1960’s and is a continuing process for identifying superior genotypes with high yield and quality traits from the available natural germplasm and/or from controlled hybridization. So far, the TRI has released 32 cultivars (clones) for commercial exploitation named as UPASI-1 to UPASI-28 and TRF-1 to TRF-4. Among the UPASI released clones, UPASI-3, UPASI-8, UPAS1-9, UPASI-17, UPASI-25, UPASI-27, UPASI-28,TRF-1 and TRF-4 are high yielders while UPASI-2, UPASI-6, UPASI-9, UPASI-20 and UPASI-26 are drought tolerant clones. Most of these clones are widely used by the industry for infilling and replanting. Certain Sri Lankan clones (TRI-2024 and TRI-2025 ) and a few estate selections (CR-6017, ATK-1 & SA-6) are also widely used for planting in southern India. Certain clones, CR-6017, UPASI-3, TRF-2 and TRF- 4 represent the quality trait. Current plant improvement programme resulted in identification of 25 accessions based on visual examination. Studies are in progress to monitor their performance. Recently released TRF-4 (BSA-13) is selected from the F1 progenies of the crosses between CR-6017 (female) and UPASI-8 (male parent). TRF- 4 is a high yielder with superior quality characters and is suitable for machine harvesting. Under germplasm collection and conservation a large number of natural variants from the old seedling populations, improved seed stocks and clones available all over India are being collected and the core collection is being maintained in the Experimental Farm which has been recognized NBPGR. Several new selections which have been recently identified for their high quality and yield potential are under multilocational evaluation. A couple of tea accessions with specific characteristics are in the pipeline and are expected to be released in the near future for commercial utilization. The division has also released five biclonal seed stocks viz., UPASI:BSS-1 to BSS-5 characterized by drought tolerance and high yield potential. Superior genotypes with high yield, drought tolerance and superior quality characters were used as male and female parents for the production of these biclonal seed stocks. Due to the profuse tap root system, these biclonal seed stocks are recommended to be used as infills and also for replanting in drought prone areas. Seed bari blocks for all the five seed stocks have been established in the Research Institute and in other planting districts for supplying seeds to the tea growers. There are specific designs of planting for the establishment of seed bari plots for collecting biclonal seeds. Seed bari plots maintained by tea gardens are regularly inspected and certified by the personnel from TRF. In the current hybridization programme crosses were made betweenTRF-2 x TRF -1, CR – 6017x TRF-1, CR – 6017x TRF-2, CR – 6017x TRI-2025, UPASI-9 x TRF-2, UPASI-9 x TRF-1, UPASI-9 x TRI-2025, UPASI-21 x TRF-1, UPASI-10 x TRF-1, UPASI-10 x TRF-2 and UPASI-10 x TRI-2025. Progenies derived out of all these crosses were planted in the nursery for studying their nursery performance. New genotypes maintained in the National Active Germplasm Site (NAGS) are also being utilized for the development of new biclonal seed stocks. Grafting of clonal plants in the nursery is another technique developed by the Botany Division.Drought susceptible scions (UPASI-3, UPASI-8 & UPASI-17) are cleft grafted on the drought tolerant (UPASI-2, UPASI-6 & UPASI-9) root stocks to overcome the problem of drought susceptibility. 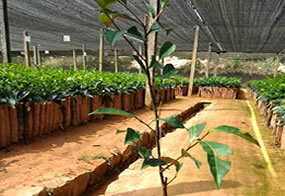 Composite plants developed through grafting are superior to the ungrafted clones in field. When compared to the ungrafted scion clones, the grafts have shown 30% increase in productivity. New scion clones (UPASI- 28, TRF-1 & TRF 2) and the drought tolerant clones (TRI-2025, UPASI-2, UPASI-9 & ATK) were evaluated for their graft compatibility. The graft success ranged from 88 to 98% in different graft combinations. Old nursery plants retained in the nursery shed most of their mature leaves after one year. If these plants are planted in the field, low centering is not possible since they are devoid of leaves in the lower part of the stem. The over grown root system of these plants has to be pruned first to retain their length up to the end of the polythene sleeve. They can be treated as rootstocks and cleft grafted with appropriate, recommended scion clones. Both the single nodal cuttings and crop shoots comprising three leaves and a bud can be used for grafting. After grafting, the composite plants should be kept inside the polythene tent for facilitating graft union. Six or seven months after grafting, these plants can be transferred to open space for hardening. One year after grafting in the nursery, plants will be fit for transplanting in the filed. Six compatible graft partners are recommended for the production of composite plants and are very widely planted in the replanted areas. Recently, BSS seedlings are also being tried as root stocks for developing composite plants. Approach grafting is yet another propagation technique to multiply the mother bushes in a short period. 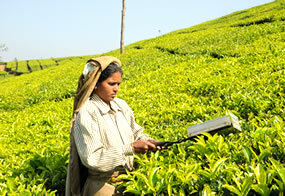 In order to register and protect the tea cultivars released by the TRI, a DUS (Distinctiveness, Uniformity and Stability) test centre has been established in the UPASI Experimental Farm under the Protection of Plant Varieties and Farmer’s Right Authority (PPV & FRA), Ministry of Agriculture. Tea descriptors prepared by the Institute are being validated in the DUS test centre. Mechanization is the need of the hour, not only in the field but also in the nursery as well. In order to increase the production of composite plants, two simple mechanical tools known as the scion maker and root stock maker have been developed. Using these mechanical tools in grafting, number of composite plants produced in a day can be increased four-fold than by producing them manually. For securing the graft partners at the graft interface, the division has also developed durable grafting clips. Certain clones are difficult to root under nursery conditions and to overcome this hurdle, Botany Division formulated the Rooting Hormonal Formulation (RHF) which is quite useful in inducing profuse root initials and further growth of the root system. 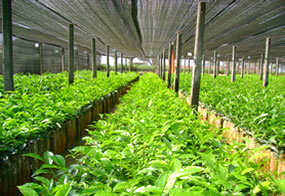 Research pertaining to style of planting, bringing up of young tea to bearing, harvesting to suit the present day labour scarcity, pruning and weed management are important areas in which the division focused concentration. Very importantly, double hedge planting system to accommodate 13,000 to 16,000 plants/ha and early centering and two-stage tipping for quick ground cover recommended by the division are being adopted by the south Indian tea plantations. In order to ensure the sufficient maintenance leaf load in the bushes pruned at various heights, optimum tipping height has been recommended by the division. Evaluation of both pre- and post-emergence herbicides is an integral part of the research programme and the division recommended a range of herbicides for control of dicot and monocot weeds. Multi faceted weed management schedule issued by the division is widely adopted by the industry to achieve economic weed control. Evaluation of alternate shade trees is a new avenue in which the divisions concentrated efforts are highly appreciable. 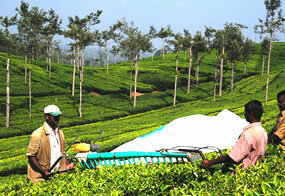 In view of mechanization in tea culture, the division conducted research on usefulness of the earth augers for making planting pits, impact of advancing shear harvesting after pruning on productivity and bush health and efficiency of pruning machines have the potential potential value in husbandry practices of tea. After the introduction of machines, the productivity of the worker has increased and these machines are now extensively used by the industry. Extensive field evaluation on integrated schedule of harvesting, both manual plucking during low cropping season and soil moisture stress period and shear harvesting during high cropping season lead to complete harvest of the crop with positive cost economics. Scientists have also engineered a lightweight hand operated shear with a long blade to hasten the harvest and to increase the pluckers productivity. Commercially available motorized harvesters are found suitable in clonal tea fields planted in moderate to gentle slopes and can increase the pluckers productivity fourfold. The special nutrients package for foliar application including all the essential micro and macro nutrients developed by the division neutralized all the adverse impacts of extended duration of machine harvesting as well as shear harvesting.